If you live in a location with extreme winter temperatures, you know how hard your starter can strain to turn over a cold engine first thing in the morning. Have you also considered the additional wear on other engine parts that's caused by cold startups in extreme conditions? You can get easier and faster starts, quicker warm-up times and provide an additional measure of protection to your engine with an engine block heater. 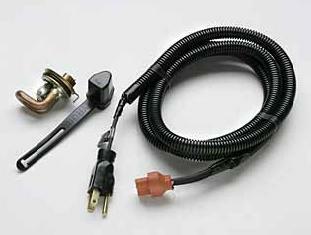 Choose the engine block heater for the powerplant in your Jeep and just plug it in on cold nights for better performance on frosty mornings.